Ice fishing is still benefiting from this cold weather with good solid inches of ice and lakes are getting more populated by anglers and their ice shacks. There is no wonder the most popular story on www.MontanaOutdoor.com was the Montana Fishing Report for North/Northwest/South Montana. CLICK HERE to listen and read these reports from Chancy, Leonard and Shelby whom always provide informative and accurate fishing and ice fishing reports. CLICK HERE to listen to the latest reports and you can find all the latest ICE FISHING NEWS HERE. 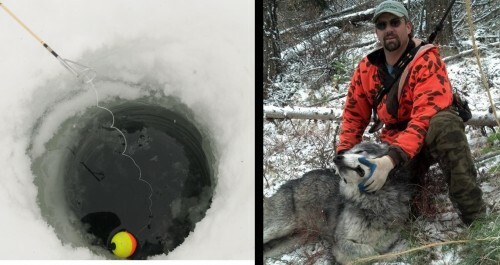 Wolf harvesting continues to increase, trappers have been helping a lot to keep the wolf population under control. CLICK HERE to read this weeks Montana Wolf Harvest Update. Check out this story about the wolf that saved a deer’s life. YOU CAN READ THE STORY AND SEE A PICTURE HERE. If you missed the Montana Outdoor Radio Show yesterday morning, YOU CAN LISTEN TO THE FULL AUDIO REPORTS (CLICK HERE). Congratulations to Ike Hofer of Galata, MT who was our 6am trivia winner and Gary White if Hinsdale, MT the 7am trivia winner. Sean Reynolds of Kalispell was our Montana Club Winner of a ski pass this week. Be sure to tune in to the Montana Outdoor Radio Show for your chance to win every Saturday morning.